So. I swallowed 6 Nystatin pills every day for a week, but today, I'm sensing the need for a little break; 2-4 pills for a day or two. I've had more severe dizziness than usual, strangely at its worst when I'm in bed. I turn over to shift positions and wow, the room spins. Very trippy. It's related to yeast toxins producing too much ear wax (gross, I know), affecting my equilibrium, so I've been using these Similasan ear drops (I love their products). This dizziness feels a lot like vertigo - Johnny Googled and whaddya know, many, many others had vertigo that went away once their yeast overgrowth was under control. Yesterday, the dizziness scared me. I did not like. I prefer the room to remain still and serene. Today, it just bums me out. And I'm exhausted. I know yeast are dying and protesting, and I know it's wise to back off the medication a bit, but it's hard because I'm so determined to cross the finish line. However, 2-4 pills are still healing to my body and I can resume the maximum amount later in the week. All of this makes writing a Curator article quite the challenge, but with God, all things are possible. Even brain function and creativity. -Fair trade Mexican vanilla/pumpkin spice coffee. We picked it up at Central Market on Sunday. It makes the whole house smell like pumpkin. 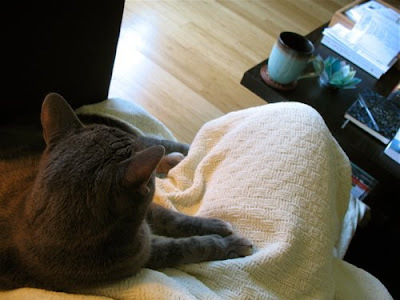 -A favorite cream-colored blanket because it's still frosty in our house. Milo has a love connection with this blanket. 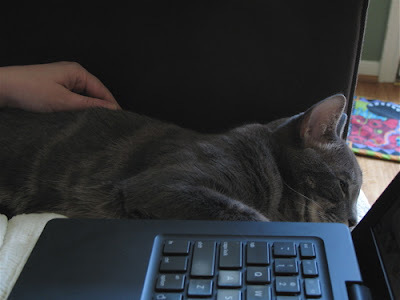 Whether it's folded neatly on the couch or covering my body, he kneads it with his paws and curls up in a contented ball (right now he's nestled between my laptop and the couch). We think it's because he wasn't properly weaned by his mama. During his first few weeks of life in our old apartment, he not only thought we were his mama, but also a soft blanket in his cage (near our bed), and the towels we wrapped him in for warmth - like a little taco. -An old issue of IMAGE - #36. Particularly, an essay by Kate Daniels regarding the portraits of Catherine Prescott. -Another great piece of reading: "Why I Am Hopeful" by Andy Crouch. -The Apple a Day tea light is another winner. -Voting early yesterday with a homemade to-go cup of rooibos chai in hand as the line snaked around quickly, thank God. -Next, we stopped by the library. I requested a book of poetry by Billy Collins - Sailing Alone Around the Room. I happened to see Mother Teresa's Come Be My Light on the shelf, so I checked that out, too. I probably won't read it cover to cover right now, but I thought I could benefit from reading a few pages about her faithfulness despite a deep internal darkness and God's silence. -Good, free catalogs in the mailbox: Shaker Workshops, Gaiam Real Goods, and J. Jill. I received the Nov. 2008 issue of domino, too. Among many things, this table brush caught my eye. And this water pitcher fascinates me - better design than a Brita pitcher, I think. -The port2port autumn leaves set also arrived in a timely fashion. -The Swedish Chef, Beaker, and Animal singing Carmen's aria, "Habanera." Hilarious. "Danny Boy" is really funny, too. -Mindless TV last night: Dancing with the Stars, Samantha Who?, and Heroes. -To be honest, Morning Prayer was the last thing I wanted to do today, but once I was in the rocking chair, I prayed, cried on the Lord's shoulder, sipped coffee, and then I felt better. -Chatting with Pastor Samson of Peace Gospel International on facebook. Yes, facebook! And all the way from India. He's so encouraging, speaking almost exactly like a New Testament epistle. I'm humbled that he asked how I'm doing so he and his ministry can pray for me today. -My husband. There are no words to describe how thankful I am; not just when I feel bad, but always. I love the photo of Milo stretched out beside you. Hang in there with the Nystatin. You'll be through this soon. I'll be praying you feel better soon. I tagged you for a meme. Check out my blog and see.